EPA Chief Scott Pruitt responded to claims that he is guilty of ethics violations during a new interview with Fox News Wednesday. The interview got a little "combative," according to Ed Henry. Yet, Henry had to ask the EPA administrator about reports that he asked for pay raises for two of his aides last month. Pruitt claims he was in the dark about the pay requests. Why, Henry asked, did you "go around" the president's back and give out those raises? "I did not," Pruitt said. "My staff did. I found out about that yesterday and I changed it." When pressed by Henry about who approved those raises, Pruitt said he didn't know, but there would be some accountability. "It should not have happened," he said. 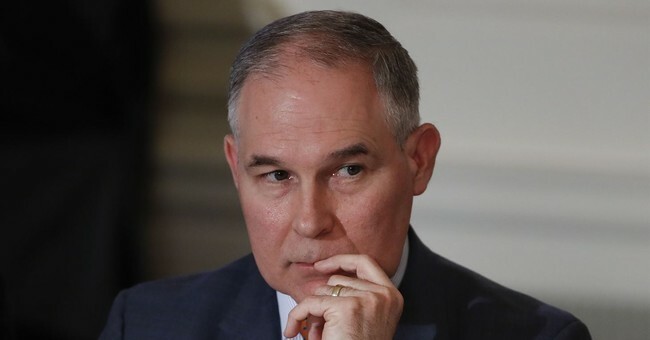 Henry noted that the two employees in question are friends of Pruitt's from Oklahoma, suggesting it is hard to believe the EPA chief didn't know they were about to receive higher paychecks. Pruitt is also facing unflattering headlines about his use of private jets and his living arrangements. This week new reports suggested he rented a Capitol Hill condo from a lobbyist's wife for just $50 a day. The EPA chief has defended his leadership. He is getting all this flak from Democrats because he has managed to cut back on environmental regulations, he argues. Yet, as Henry noted, at least two Republican legislators are also demanding he resign. Pruitt has no need to sweat, according to President Trump, who called his EPA administrator Monday to tell him he "has his back." Ed Henry's full interview with Pruitt will air on Fox Wednesday night at 7 p.m.